February 2007. Everyone is expecting great things. David Moores and Rick Parry have sold the family silver and we have new owners, Tom Hicks and George Gillett, who we are told are billionaires and fans are expectant of no debt, big transfer budgets, new stadiums and putting Liverpool FC back where it belongs, on it's perch. February 2010. No one expects great things. Tom Hicks and George Gillett 'own' the club with the Royal Bank of Scotland's money. None of the promises have been delivered, the family silver is tarnished and we are the club with the poorest billionaires ever. Tom Hicks and George Gillett aren't welcome at Liverpool Football Club. They were at first - they made promises that the fans believed, and we all looked to a rosy red future. That future now looks dark and bleak under Hicks and Gillett, and we as fans need to change that. So why aren't Tom Hicks and George Gillett welcome..
As of the latest published accounts the club has a net debt of £351 million. It was approximately £44 million when they took over from David Moores. This debt means repayments of £30 + million every year. The club is now for sale, but the valuation of the club by Hicks and Gillett is too high and we just then left with a debt we didn't want or have in the first place. Tom Hicks, speaking in May 2007, does not hide his view on the leveraged buyout at Liverpool "When I was in the leverage buy-out business we bought Weetabix and we leveraged it up to make our return. You could say that anyone who was eating Weetabix was paying for our purchase of Weetabix. It was just business. It is the same for Liverpool." They have promised much and delivered little. Their job as 'custodians' has been nothing but making it up as they go along, taking expenses (over £2 million as shown in the accounts up to 2009) from the club for their no expense spared trips to come and watch us play, entertaining family and friends along the way. 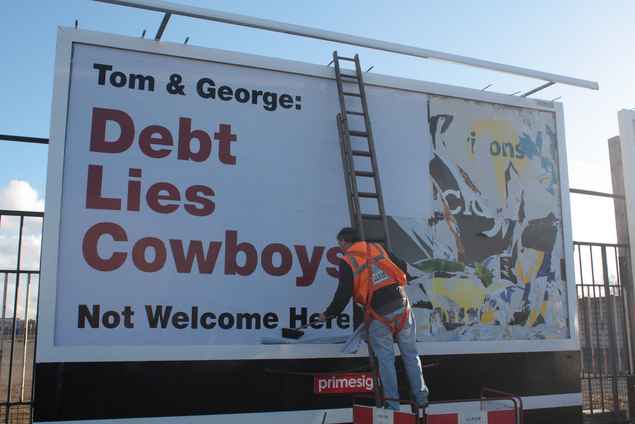 Tom and George - Not Welcome Here. To support us in our campaign to rid LFC of Tom and George, please join us.